Born in 1934 in Dresden, Germany, Theo Lehmann lived through both the Nazi era and the Communist-ruled German Democratic Republic (GDR). Ordained in the Lutheran Church of Saxony, he was called to an urban parish in Chemnitz. There he introduced a youth worship service marked by contemporary music, uncompromising preaching of the gospel message, and calls to discipleship in Christ that attracted thousands. Lehmann then embarked on an itinerant ministry of youth evangelism with Jorg Swoboda, a Baptist musician and youth leader. He gained the undying enmity of the Communist regime, was under constant surveillance by the dreaded secret police, and was rejected by many of his own ministerial colleagues. Theo Lehmann was also the best-known scholar of jazz and blues music in the GDR. Indeed these musical forms expressed so well his own longing for freedom. His reputation as an evangelist spread far beyond the narrow confines of East Germany, and he was named to the Lausanne Committee for World Evangelization. His dreams were fulfilled by the fall of the Berlin Wall, and he was then free to proclaim the Word of God throughout the reunited Germany. The author of over twenty books and composer of numerous songs widely sung in churches and evangelical gatherings, Lehmann is today his country's foremost evangelist. His life is an extraordinary witness to the power of God and one person's faithfulness to the gospel message. This book brings to light the gripping account of Lehmann's unbowed witness to Christian faith amid the totalitarian oppression of Nazi Germany. Moreover, it offers a compelling case study of how revitalization can occur even, and especially, amid such adverse conditions, for which there are numerous applications in our present day. --J. Steven O'Malley, John T. Seamands Professor of Methodist Holiness History, Asbury Theological Seminary, Wilmore, KY It seems to me that Theo's interest in jazz is itself a testimony to the freedom the Spirit brings--the improvisation by which God counters the dark passages of life under tyranny. I hope Theo's story will profoundly challenge those of us in North America to realize again that the gospel is not only about our personal salvation, but that Jesus is Lord over all the powers--political, economic, cultural--which so easily seduce us. --Leighton Ford, President Leighton Ford Ministries, Lifetime Honorary Chair, Lausanne Committee for World Evangelization On my first visit to the German Democratic Republic nearly forty years ago, I heard of a daring young pastor named Theo Lehmann, whose use of blues and jazz in the service of proclaiming the gospel of Jesus Christ was provoking Communist officials and appealing to great numbers of German young people within the Marxist system. This sparklingly told narrative should command wide attention and careful reading--lest we forget. --Robert Kolb, Missions Professor of Systematic Theology, Director of the Institute for Mission Studies, Concordia Seminary, Saint Louis Edwin P. Arnold taught German in public schools from 1958 to 1968 and at Clemson University from 1968 to 2000. He led twelve study-abroad groups into both Germanys between 1980 and 2000. Richard V. Pierard is Professor of History Emeritus at Indiana State University and formerly Stephen Phillips Professor of History at Gordon College, Boston. 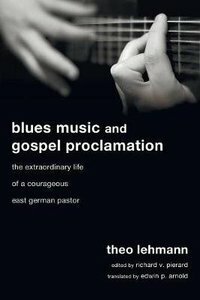 About "Blues Music and Gospel Proclamation: The Extraordinary Life of a Courageous East German Pastor"